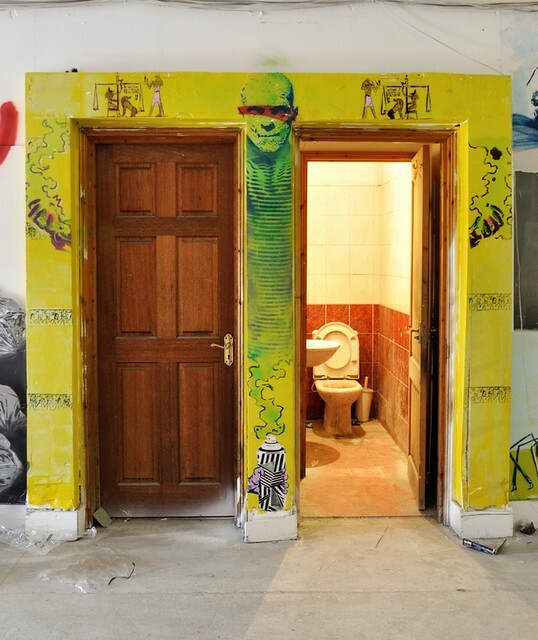 Every year or two the culture of street art throws up a show which turns the spotlight on itself, doors are opened to a wider public without asking them to walk into a stuffy “proper” gallery. 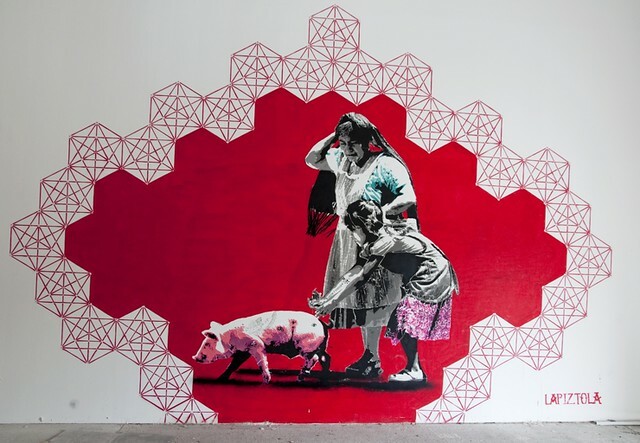 Pablo Fiasco (his mum possibly knows him by another name) has located a very interesting spot in North London where over the Easter weekend an exhibition of painted walls, stencils, installations, films and other assorted diversions will take place. The location is one of those formerly industrial areas where industry has drifted away but the residual properties have yet to be anointed with essence of gentrification. Formerly occupied by a courier company, 2 sides of the building have been converted for accommodation but are separated by a bizarre irregular void for which there appear to be no takers in this economic climate, so it has become an irregular host of assorted cultural activities. 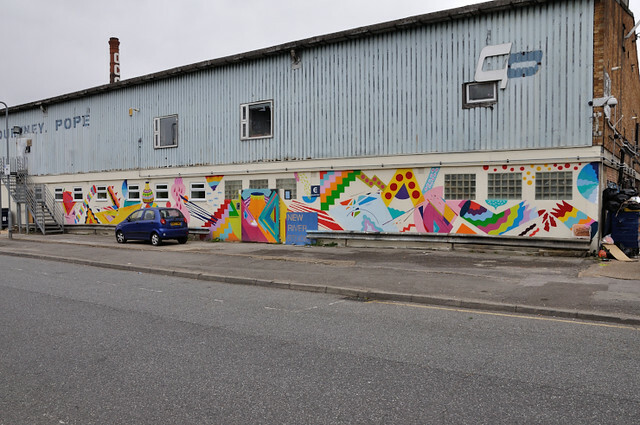 You will know 199 Eade Road by the bright colourful Kenor and Zosen collaborative mural across the façade facing the road. However, the show isn’t in that building, you’ll find it down the ramp to the right of the building in the metal clad building next to 119. 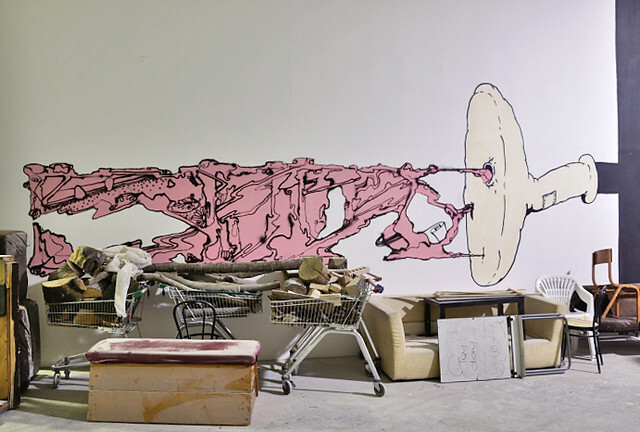 At the time of our visit, only Pablo Fiasco himself was onsite, a huge collection of paint and stencil materials and work in progress art sprawled across the floor. Pablo goes back a long way and is very well connected, which reflects in the diverse array of talent and backgrounds on view. 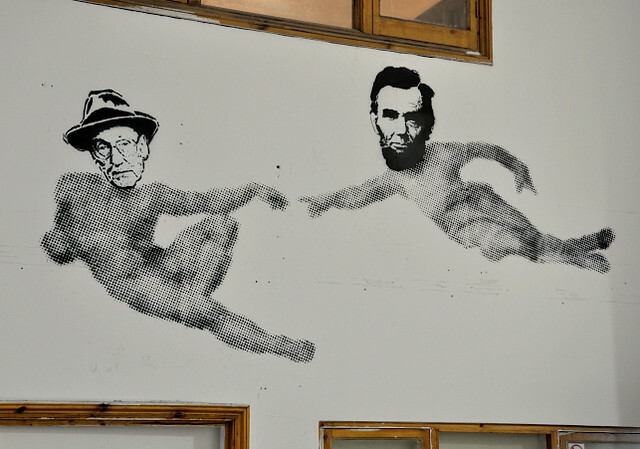 Most of the work he will present in this show is collaged stencils, though as a teacher and filmmaker his art practice is much broader. 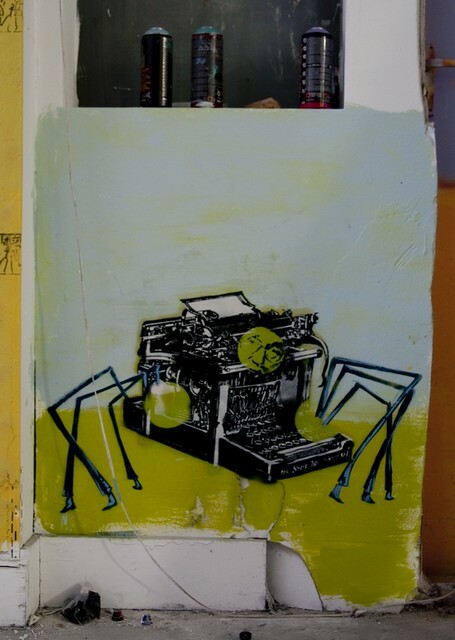 While his signature piece is an amazingly intricate and venerably ancient stencil of an equally antique typewriter, his work includes a lot of characters with Abe Lincoln, Lenin, Lee Harvey Oswald and George Bush popping up in surreal interactions. 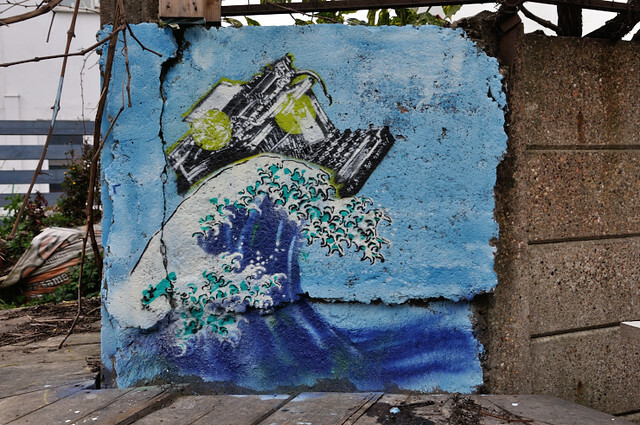 The typewriter stencil took three months to cut and is a veteran of an amazing 500 uses, including a manifestation as a large spider in the building and a Hokusai wave break surfer outside. 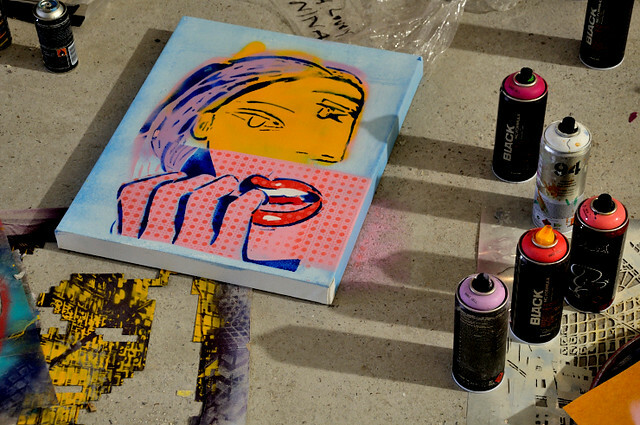 Particular striking eye candy was this Picasso/Roy Lichtenstein mash-up that was lying on the floor. 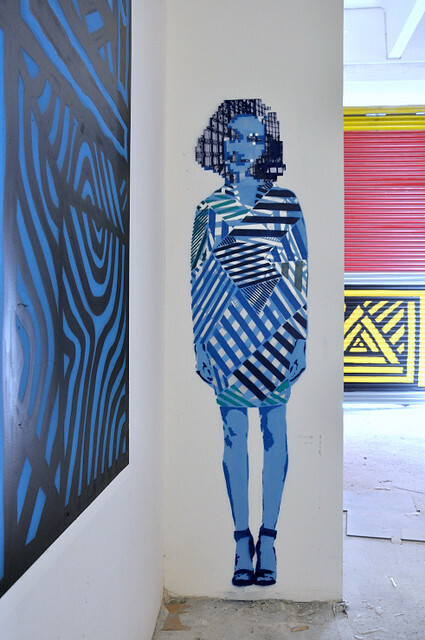 Dazzle’s use of striking patterns borrows both name and effect from the camouflage technique used on World War 1 warships, his stencilled portraits have been seen on the streets of East London. Pablo Fiasco contributes intricate architecture doubling as a hairstyle to this particular Dazzle figure. 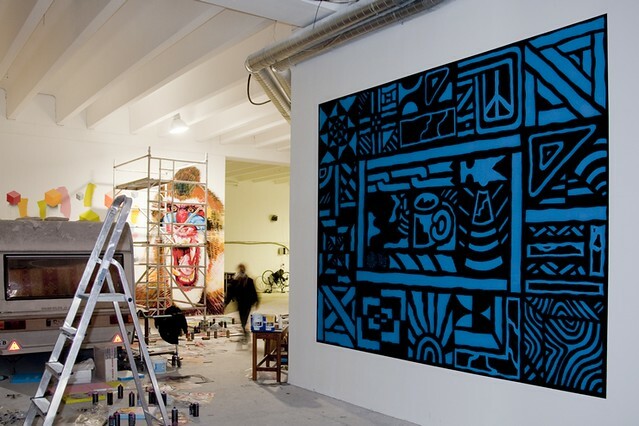 Some such as Dotmasters and Zosen who exhibited at Pure Evil in 2007 and contributed to CANS 2 in 2008 are long standing street artists. 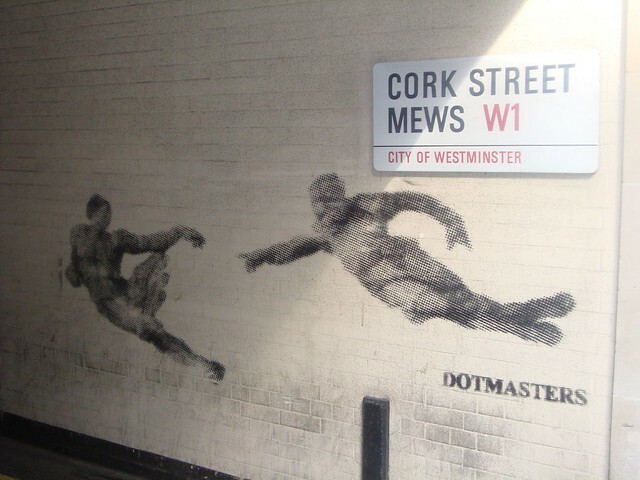 We haven’t seen this Dotmasters’ classic outdoors since it was rendered in an alleyway adjacent to some very posh London galleries in Cork St in about 2007, Pablo Fiasco comically subverts it so that Abe Lincoln is creating William Burroughs rather than God creating Adam. 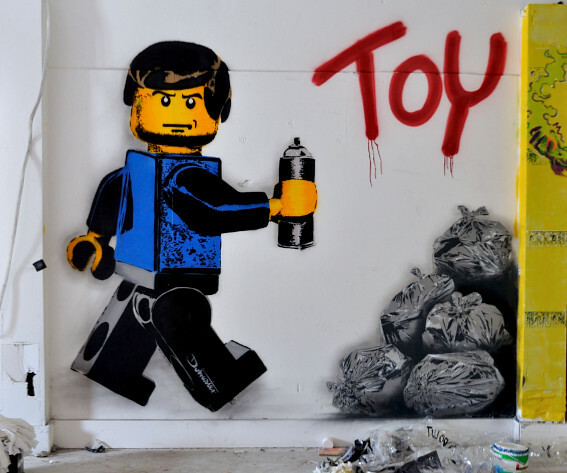 Dotmasters is rolling out not just ancient history but also a completely new stuff riffing on the word “Toy” which in graffiti circles means “amateur, novice, beginner”, this follows on from the new Robby The Robot piece which appeared in Shoreditch last week. Goodchild has obviously enjoyed creating a lot of impressive geometric patterns both indoors and out at the site, here we see MNKY in the background snarling at the abandoned caravan which it wants out of the way by the weekend. In addition to the wall art, there are plans for projections including a posthumous showing of soldier graffiti captured by war photographer Tim Hetherington, “oldest and closest friend” of Pablo Fiasco killed in Libya in 2011. There will also be a bar and music with DJs mashing up music by people I have never heard of. The space is large and the walls irregular, placement is haphazard and there is art indoors and outside, the result is a pretty exciting art treasure hunt with a lot of work prompting questions like “whose face is that?”; “which artists are collaborating where?”; “how did this surreal mash up pop into any sane persons head?” Pablo Fiasco was in full flow at the start of the week, other artists such as Nylon are expected to make their contributions over the next few days and even today more artists are being added to the roster so there remains lots to be created and discovered. Expect a very chilled vibe in the daytime, this feels like it will be the kind of event where the family could happily drop in for a bit of culture, a bit of fun and a bit of chilled out time. Maybe not the bank holiday weekend spectacular that Banksy’s 2008 Cans Festival was or the dank edgy gloom of Nelly Duff’s abandoned tenement basement “Banger Art” of 2012, perhaps something more akin to the One Foot In The Grove under the Westway in 2009 but more indoors and less flame belching steam punk monsters. Dr d., London’s top political malcontent street artist is on a roll and has been out again, this time taking over pavement advertising sites. 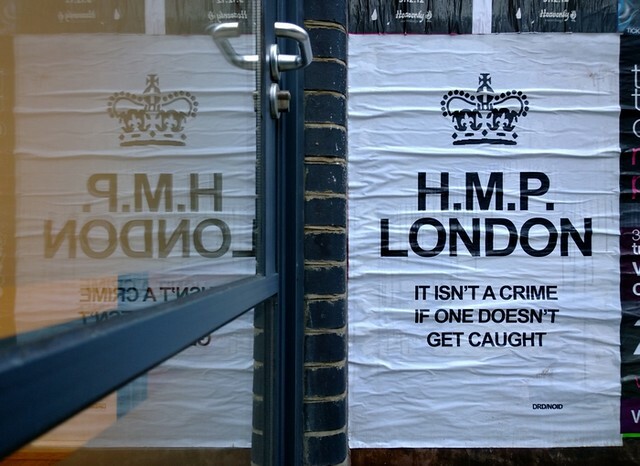 The new version of HMP London (HMP: Her Majesty’s Prison] open prison advises us that innocent or guilty, we are all now being spied on. 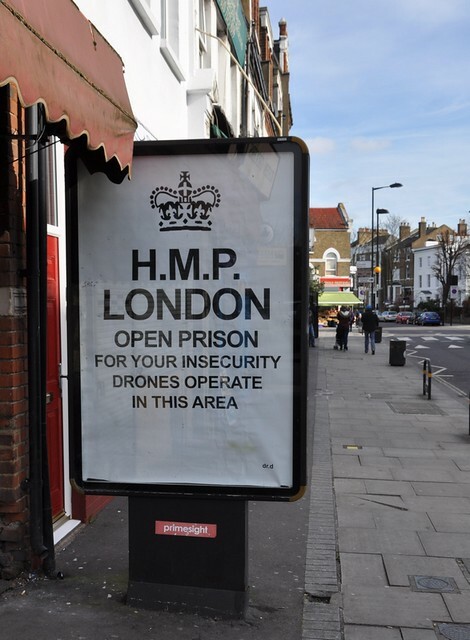 Highlighting the pernicious erosion of freedoms through unwanted surveillance is the main thrust of these previous versions of Dr d's Open Prison. 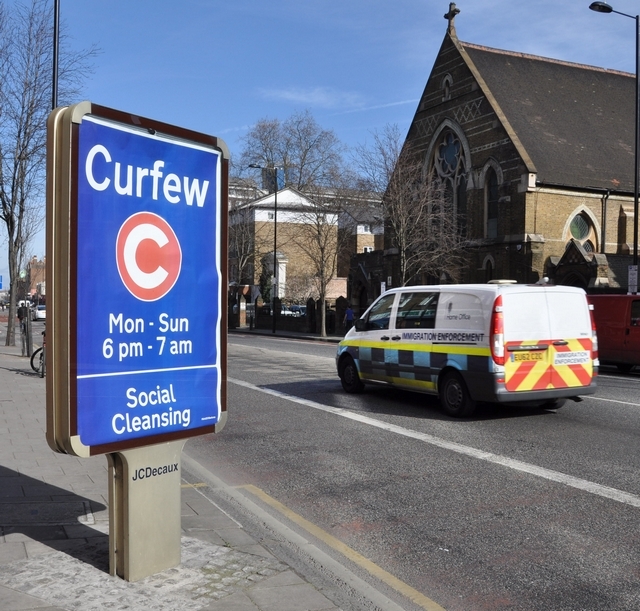 Social cleansing Curfew Zone works in a variety of way but when a van with Immigration Enforcement drove past this morning, Dr d’s subversion became a clear warning to beware the insidious intrusion of UKIP’s thinly disguised racism into mainstream politics. Cycling around hunting for these pavement advertising boards makes you realise firstly how much you just filter these thing out of your consciousness (clever thing the brain) and then, how the hell did so many pavements become obstructed by these monstrosities. You can bet that if you blocked the pavement like this for a good cause but hadn’t paid for the pleasure you’d be having your collar felt double quick time. The authorities don’t mind the obstruction to the pavements but they do mind you doing it without their control and without topping up their counting houses. 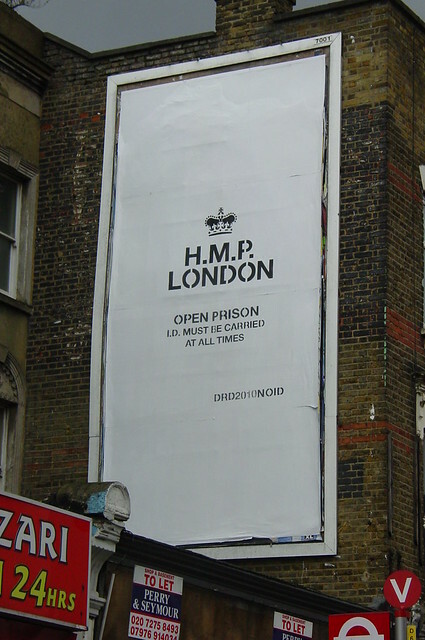 These delicious political annexations of the mechanism and locations of paid for advertisements by Dr d is one of the un-sung wonders of London’s street art scene. 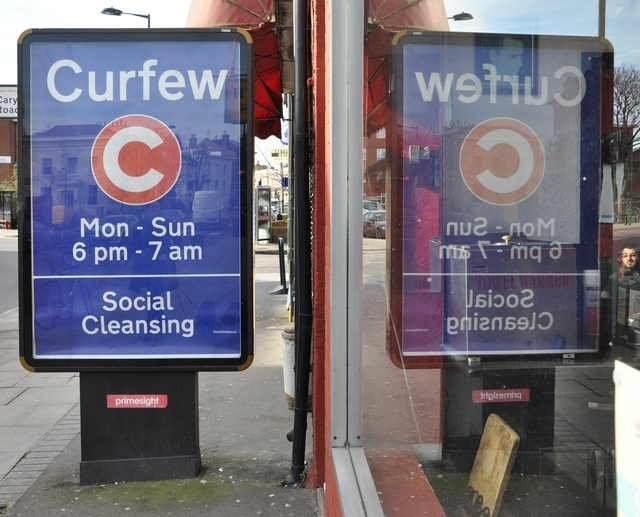 Read HERE how and why Dr d declared the City of London a Central Curfew Zone.